Hey Everybody! 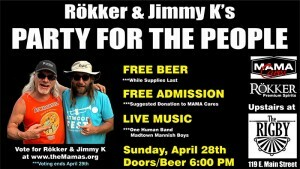 You are all invited to Rökker & Jimmy K’s PARTY FOR THE PEOPLE. A few nights ago I received a message from Jimmy K who was attending the MAMA’s Finalist Announcement Party to inform me that I had been nominated for “Music Fan of the Year”. At first I thought it was an April Fools prank, but alas, it was true. Nothing, it seems, happens without reason so there must be an underlying purpose for this unexpected nudge from the universe… so let’s have a party! Whether or not you vote for Jimmy K (Radio Personality) or Rökker (Music Fan OTY), come down and party like a rockstar at the Rigby Lounge on Sunday, April 28th at 6pm. We’ll have live music from One Human Band and the Madtown Mannish Boys. Free Beer while it lasts, and Rökker Vodka drink specials all night long! There won’t be an admission fee but we are suggesting a donation to MAMA Cares at the door. MAMA Cares is a fund to help musicians in times of crisis. It is too often a musician falls without adequate healthcare. You can donate online at www.themamas.org/mamacares or donate at the party, we’ll have MAMA Cares donation boxes available! Fans and musicians alike can vote for all of the awards at www.themammas.org and all nominees are welcome at our PARTY FOR THE PEOPLE! Come down and celebrate with Jimmy K & Rökker at the Rigby Pub on April 28th at 6pm. Thank you Madison Music Scene, you are the best!